A sold out crowd attended last night’s Architects for Animals “Giving Shelter” benefit for FixNation at the HermanMiller showroom in Los Angles, and the evening event was a smash success. Attendees browsed the upscale items in the popular Hauspanther Style Lounge, admired the display of community cat bowls decorated by celebrities, and voted for their favorite outdoor cat shelters, designed and donated by more than a dozen top LA architectural firms and designers. Other crowd favorites included shelters created by Warren Office + Schmidt Designs, Perkins + Will, and a collaborative project by Formation Association, Artkura, and BuroHappold. 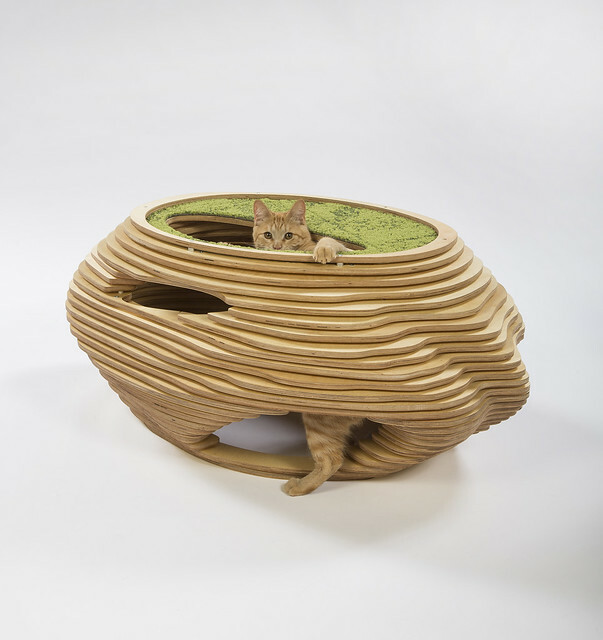 All structures on display were the end product of many hours of thoughtful cat-inspired and -optimized design work, flawlessly executed in a variety of construction materials ranging from metal to thick grey felt to concrete to astroturf. Some of the designs on display incorporated items such as built-in feeding bowls, toy mice, and even an actual fishbowl (complete with fish); others were accompanied by a video showing cats interacting with the shelters, an added touch that really brought the projects to life. To bid on select shelters, celebrity cat bowls, and Hauspanther Style Lounge products, visit www.ebay.com/usr/fixnationla.